Aiggin Stone on Blackstone Edge, near Littleborough. OS Grid Ref SD 9732 1713. The Aiggin Stone on Blackstone Edge is best reached via the A58 and is 2 miles to the north-east of Littleborough. This well-defined and quite well-preserved stretch of Roman road going up over Blackstone Edge can be reached on foot, of course, from the A58 and after about half a mile the Aiggin Stone can be seen at the side of the Roman road. Some historians now believe this is a medieval road or trackway that was constructed over the foundations of the Roman road in the 13th century, eventually becoming a packhorse road. The Roman road, if that’s what it really is, with it’s worn flat stones and gulley or channel running down the middle connects MAMUCIUM (Manchester) with VERBEIA (Ilkley) and then EBORACUM (York). 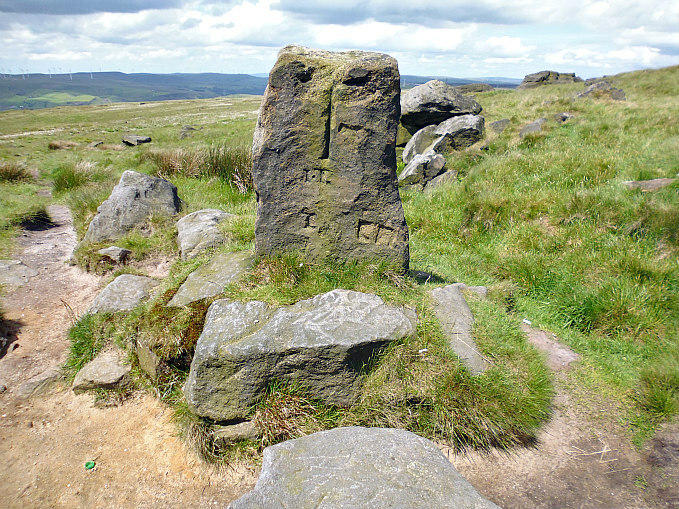 The inscribed Aiggin Stone stands in a flat rectangular area amidst a jumble of large recumbant stones and a cairn, and marks the boundary between Lancashire and Yorkshire. 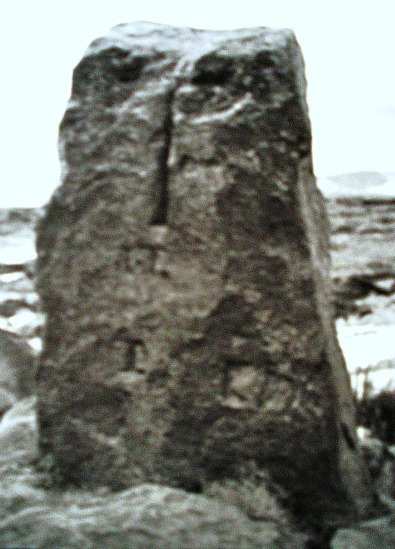 It is, in fact, a gritstone pillar standing at nearly 4 feet high, and carved on it there is an incised cross as well as the letters I and T. A plaque says the Aiggin Stone is a Medieval waymarker that is 600 years old. Originally it was 7 foot high but over hundreds of years it has been pushed over, or fallen over, and the lower section broken off. The stone tapers towards the top where the Latin-style cross is carved. A pointed cairn stands beside the waymarker stone, no doubt being added to over hundreds of years by walkers traversing the high-level ancient route between Littleborough and Ripponden, high up on the windswept Pennines moors. These marker stones or waymarkers were used for religious purposes; travellers would stop at the stone and say a prayer for a safe journey over the bleak, windswept moors. Some of these stones were even used by people carrying coffins; the coffin rested here and prayers for the dead would be recited, perhaps a stone or two placed on top of the cairn as well. Just below the carved cross are two letters I and T which obviously have some religious significance, possibly meaning IN TEDIUM or ‘In the Lord we trust’ or ‘In praise of the Lord’. Near the bottom of the stone some more letters: an I or a T and perhaps ED (In Tedium). There are other stones on the moors around Blackstone Edge: The Letter Stones to the south of here, the Hanging Rocks and Rocking Stone near the M62 motorway to mention but a few. Categories: Aiggin Stone on Blackstone Edge Lancashire/Yorkshire border, Roman road on Blackstone Edge at Lancashire/Yorkshire border | Tags: Aiggin Stone at Blackstone Edge on Lancashire/West Yorkshire Border | Permalink. Chris Sainty writes: The Aiggin Stone looks remarkably like the Te Deum Stone near Withins Gate above Mankinholes. If you look at the 2 stones side by side they are almost identical although the the Aiggin Stone has much more wear. I would say they both share the same functionality. Thanks Chris.